Leaf S - replacing the radio? Re: Leaf S - replacing the radio? for 99 dollars. Works well for my use. It has inputs for the steering wheel controls, but I didn't bother with trying to figure them out or get an adapter. I used this harness. Note that amazon says this does not fit the leaf, but it actually does work fine. I did buy an antenna connection adapter, needed bc the leaf antenna requires 12 volts supplied through the antenna connection. Bought this for filling the gaps on the sides. A ruler and razor knife are all that are needed to trim to correct fit. The hands free Bluetooth work fine with my old iphone and my newer BLU android phone. 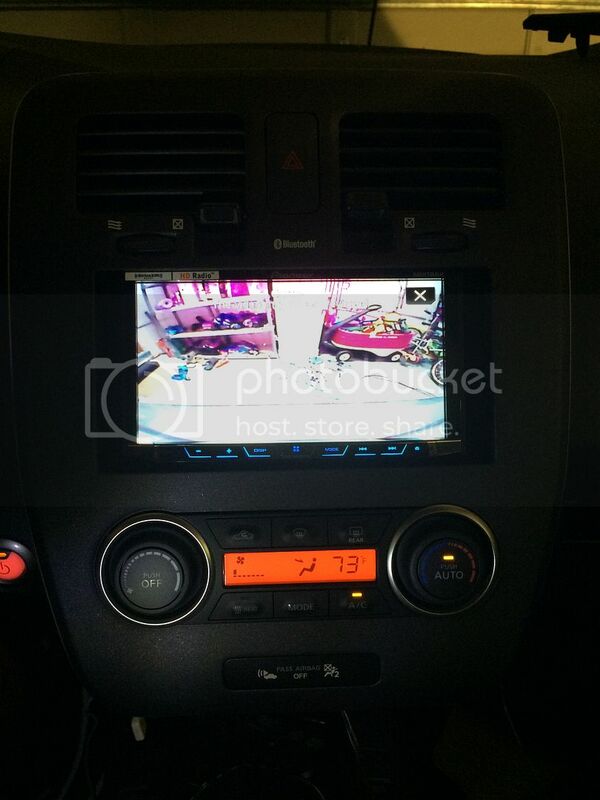 Has automatic muting and switching display to the camera when I put car in reverse. I did not connect the original Leaf mic which is in the switching unit above the rearview mirror, and the builtin mic in the new head unit doesn't pick up my voice as well as the Leaf mic, but still works well enough. The display is not quite as bright as the OEM display on my wife's SV, but brighter, and of course larger, than the OEM unit on my S.
I think this depends on what you are looking for. For most, it probably isn't worth it. I wanted HD radio, a cleaner signal to my amps, a larger screen and bluetooth audio. 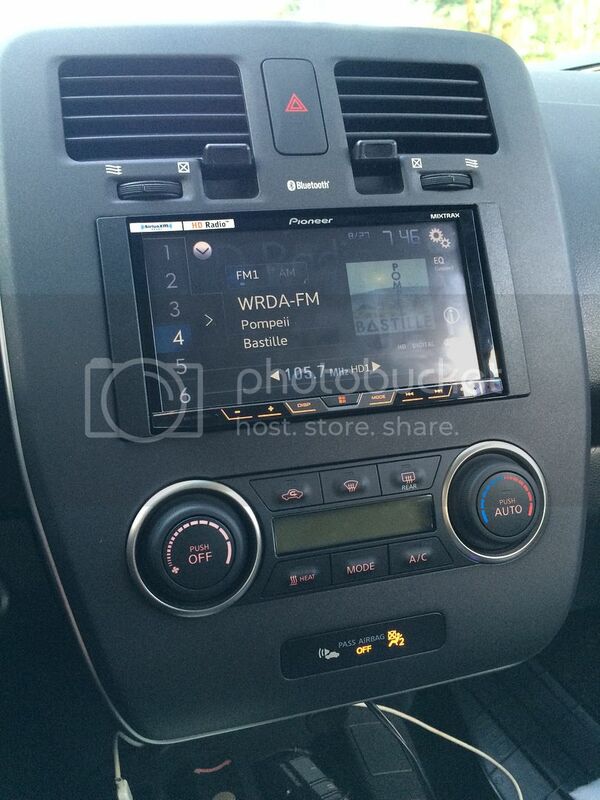 i think it is crazy that they have bluetooth on the stock radio but don't support bluetooth audio. I did loose steering wheel control for the bluetooth calling, but I have a large screen that is easy to reach and navigate. powersurge wrote: I have the 2015 "S" and actually feel grateful that I got the goodies I got with that radio, AND that it tells me the names of the stations, songs, and artist on the radio!. I have never had that! PS - Also, I have been into home and car audio for many years, and think that for what it is, the stock radio is pretty good. Also, I have always thought that replacing the stock radio reduces the value of the car. Have fun experimenting with your cars guys!! I also have a 2015 (traded in the 2014 for the newer model). I leased mine, so making everything reversible was a priority. Everything I have done can be undone by simply unplugging a harness. booper wrote: Yeah, agree with the previous 2 posts. I am wondering if anyone has had any luck adding component speakers up front in an S - maybe the best bang for the effort in a stereo upgrade for the S.
First, The title of this thread is about replacing the radio. So, I understand if people don't want to replace the radio or think it is a bad idea, but that was what this thread is about. Booper, the hardest part is going to be wiring into the door. Putting the tweeter in the a pillar is fairly simple. Tapping into the front speaker wires behind the stereo is simple as well so you could just grab the signal there and then route it to the crossovers, then tap back into it for the front door speakers. If you need a diagram, let me know and maybe I can pull something together. I understand your points Pereze. What I am referring to is that you talk about tapping wires, and doing things in the doors as if they are easy for the readers of this thread. Someone who knows how to do these things does not even need to read all these posts, they just do the job (all cars are the same pretty much) with the same ease as putting their socks on in the morning. I am concerned that people who have never installed a radio or worked on their car will get "brave" and mess up their nice, new, working cars just to get an "upgraded" radio. pereze wrote: Wow, didn't know this thread was still alive until I was doing some additional searching a few minutes ago. I thought I might be able to give back with what I have learned so far. I was only able to use the middle insert and used a glue gun to attach it to the main dash kit. The wire harnesses for the leaf are odd. You will need multiple harnesses if you want to maintain certain functions like backup camera, steering wheel controls, usb, etc to work. Here is the completed harness in all its glory. I know it looks really bad, but I did clean it up a bit and tie it up nice. A bonus of the leaf is there is a lot of room behind the radio. For the backup Camera I used the Ax-NIS32swc harness. This harness says it is for steering wheel control, but I found it mostly useless for anything but the camera. The camera on the Nissan's (and some other OEMs) are 6v cameras. While I read reports that you could feed it 12v, I didn't want to risk it so I dropped in a 12v to 6v step down converter. I wired that into the harness and plugged the RCA into the back on my new double din. The generic Nissan harness does not have wires for the steering wheel controls. I used a wiring schematic to figure out the pins I needed to use and then added wires from an extra harness I bought. If you get some good pliers, you can pull the wire out of the harness fairly easily and push it into the harness you are planning on using. I used the Axxess ASWC-1. If you look on their site for instructions for the Nissan Frontier, you will find the right pins and connections. For me, I had so many different things to power, I used a relay to help distribute the power. You need power for the antenna, camera, steering wheel control module, emergency brake by-pass, the stereo itself and for a relay to any amps you are running. It seemed crazy that all of these things would need power, but it worked out in the end. I am REALLY happy I made the change. It was a pain, and took a lot of planning, research, etc, but I love having a solid output to the amps, HD radio, Bigger backup camera, etc. I have only gotten volume controls to work from the steering wheel controls, but that was the main thing I wanted to work. I haven't had time to mess with it, but I wouldn't be surprised if it was something I did wrong that is causing the Source switch to not work. Here is a (Bad) picture of what the rear view camera looks like on the screen. Here is a first pass at the dash kit around the stereo. I ended up moving it back a little so it is more flush with the sides. *One note: Because of how far back the stereo sits and this particular stereo having a flip down screen, it doesn't flip down. I thought about spacing it out so the front of the stereo sticks out more but I haven't needed the CD/DVD slot in 6 months so I am not sure if it worth the effort. That looks fantastic. If I had an S, there's no way I wouldn't do this. 2013 SV + Premium Pkg. No QC. I assume no HD radio even in the 2015 SL model? 2016 SV has FM and XM radio, but both are nothing special. I find that XM compresses the dynamic range a lot making it annoying to listen to. I'd rather listen to FM with a truncated band, but than you are stuck with commercials. Phone streaming it is . I am grateful for your post! This is EXACTLY what i'm looking for. I already signed a disclaimer to myself that allows me to kick myself in the head _if_ i decide to attempt this and screw up. I've never done this before, and if I wreck my radio, I would never blame you. I'm sure others who are not as level-headed might, but I think this forum is more for people who appreciate being information being shared, and learning from others. Even if I never attempt this, just reading about it was a lot of fun and I have to give you props. Excellent job. Pereze! Thanks for all the info you put together! I have installed new stereos and systems in every car I have ever owned and this one has had the least information available of any of them. And with trying to integrate the reverse camera, steering wheel buttons and everything else your info has saved me a ton of time and effort, so THANK YOU! 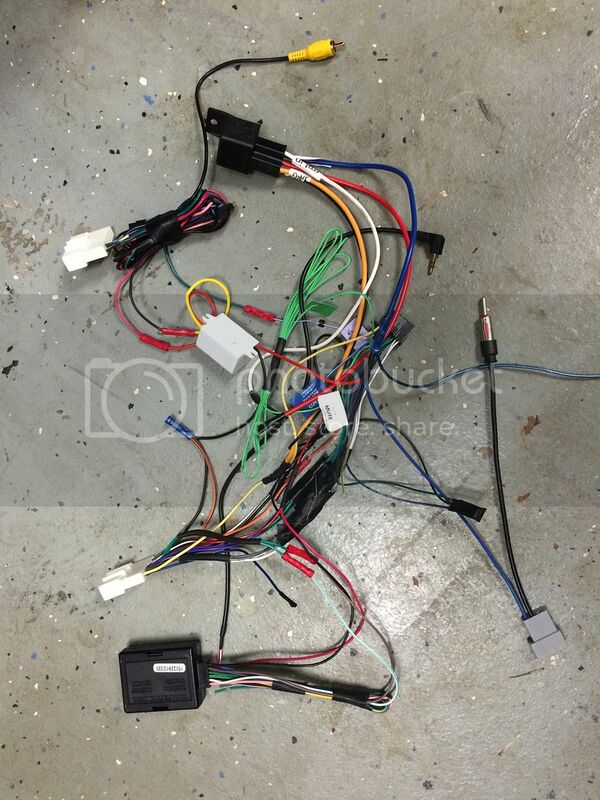 One request though, is can you post the schematics used to figure out the wiring? I'm sure I could dig them up, but if you have them handy, that would be super helpful! The thing that really kills me about the radio in the "S" is the lack of BT audio streaming! The other fatal flaw is that the BT handsfree doesn't work properly with my wife's iPhone to take incoming calls (press the pickup button and the call is answered on the handset and the radio stays on). Plus I wanted something with NAV integrated and Spotify. Found the Pioneer AVH-X2800BS for $213 at Best Buy that has everything I was looking for. All my wiring parts are on order and I hope to be able to share a success story with y'all next week when I have time to install it. I'm also looking at replacing my 2015 S audio system because of lack of BT audio streaming , was looking at android audio system's , not sure if frys electronics or best buy will install this ? Typically component speakers take more power to drive than regular speakers. I upgraded the speakers to some three-way Sony 4 ohm speakers, and the stock radio barely pushes enough power to drive them. For components, I recommend a 4-channel amplifier with speaker-level inputs from the stock radio, then running your own speaker wires to each speaker. Not an easy feat, but I doubt you're going to get anything like you're expecting from the stock "S" radio. The Sony speakers I added do a great job of increasing the treble that was missing from the old "whizzer cone" stock speakers. The bass response, however, took a hit. Once I put in the subwoofer, I think things will sound balanced.